In a two-part special for Holy Week, artist Lachlan Goudie goes on a trip of a lifetime to the Holy Land, sketching and painting the people and landscapes he sees there. In a vibrant two-part special for Holy Week, artist Lachlan Goudie packs his easel to undertake a trip of a lifetime. Part travelogue, part spiritual quest, part artistic exploration, this series transports the viewer visually and emotionally as Lachlan challenges himself to capture the look and feel of the Holy Land and the Bible story. In the first episode, Lachlan follows Jesus's last days on earth, travelling from the north of what is now Israel to Jerusalem. It's a pilgrimage that millions undertake and a story of love and suffering that has inspired some of the world's most remarkable masterpieces. From an early age, Lachlan was gripped by a vivid sense of the Holy Land, and especially the Easter story gleaned from the images in his illustrated children's Bible. As he grew up, those images were supplanted by others - the great masterpieces of Leonardo and Raphael, among others. Above all, Lachlan absorbed the Bible story through the many powerful paintings of the crucifixion by his own father, the artist Alexander Goudie. All these artists had one thing in common: they had never been to the Holy Land. Lachlan has always wondered what it might be like to visit and paint the actual sites where the Bible stories took place. In this film, Lachlan explores the Holy Land for himself, sketching and painting the people and landscapes he sees there - looking afresh at its sacred sites and bustling streets, through the eyes of an artist. 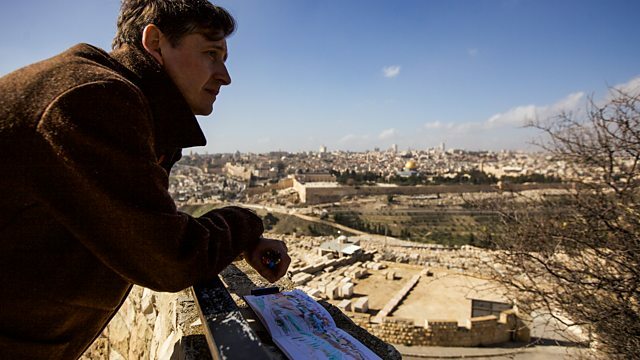 Exploring and sketching the key sites of Christianity that marked the end of Jesus's earthly life, will the experience of working and travelling in the Holy Land make him think about his own relationship with the Bible story? Along the way, in a series of surprising encounters, Lachlan meets locals who have their own take on daily life in the Holy Land. This is personal odyssey for Lachlan, exploring the places his father painted but never saw, rooted in the past but brimming with life in the present day.